Cities are a common and natural characteristic of both nature and human cultures over the last 10,000 years. Ecologically, both natural and human cities are regions of concentrated animal life, intense energy consumption (respiration, or R), and concentrated material accumulations and flows. They require much larger regions of net production (P) outside of the city to generate the food and other resources used within the urban area and large amounts of auxiliary energy to move that food and other requirements into the city and to remove wastes. There are many parallels between natural ecosystems and cities. Both contain abiotic (rocks, water, minerals, nutrient, houses) and biotic (trees, plants, animals) structure. For example, forested ecosystems have developed soils (abiotic structure) that allow for trees (biotic structure) to capture solar energy and feed energy to the rest of the ecosystem, including soils. This energy is essential for constructing the structure, and the structure is essential for maintaining the ability of the system to continue to capture and utilize incoming solar energy as well as to capture and hold water and recycle wastes. 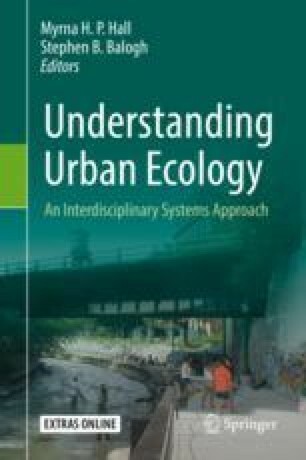 This chapter gives various examples of how urban ecosystems are like natural ecosystems in both structure and function and concludes that because humans are part of the biosphere, cities are really natural systems. It also concludes that the principal distinction between pre-Neolithic (Stone Age) human societies and Neolithic ones, or between Neolithic societies and modern industrial societies, is the amount of energy required to create and maintain the incredible infrastructure of modern cities. Modern urban areas have per capita GDP, energy consumption, and greenhouse gas emissions that are 2–3 orders of magnitude higher than subsidence-based populations in poorer countries. This suggests that urbanization is not a solution for resource scarcity-related problems in the twenty-first century. The online version of this chapter ( https://doi.org/10.1007/978-3-030-11259-2_2) contains supplementary material, which is available to authorized users.